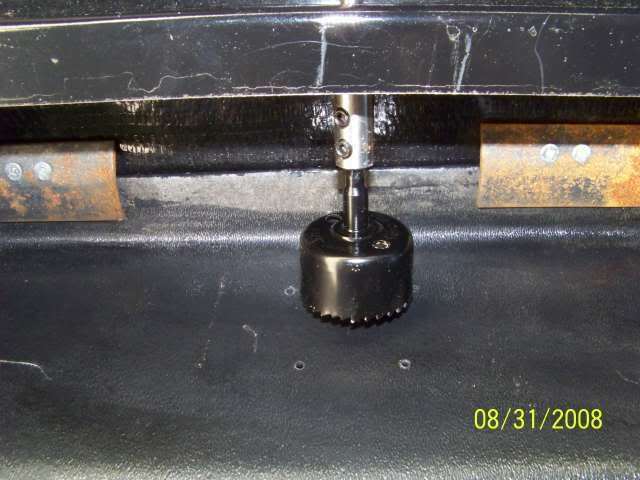 Below is my install of rotary tank sprayers in my T310SR. 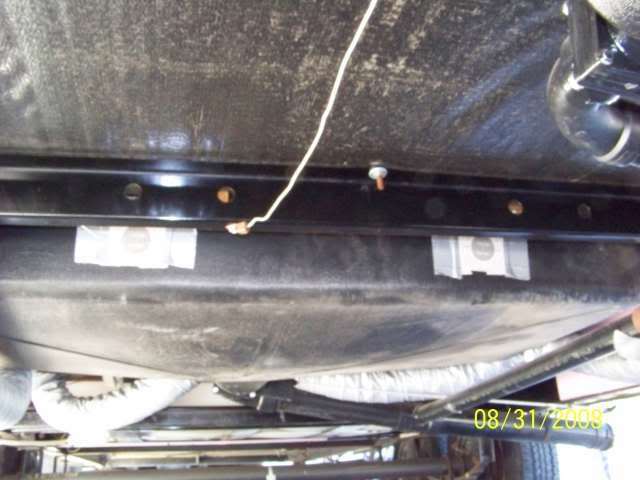 As you see this TT bottom it is the enclosed tanks option Sunline provided. The layout is different then the exposed tanks setup and as such some things my not apply to your tanks. But you can adapt as needed. I will do most of this with pics as it says more then I can in words. I used the Camco Rotary spray nozzle. On my prior T2499 I ordered from Sunline the parts they would of used if it was installed at the factory. The Sunline sprayer is stationary and looks like this. The Sunline sprayer is similar to the Quicke Flush by Camco but is a different brand. It is a straight nozzle that squirts straight ahead and on some angles. It worked good however I wish I had 2 of them in the tank to speed things along and get better coverage. This time I wanted to try the rotary nozzle. With my tank layout, I used 2 in the black tank and 1 in the gray tank. The black tank is a shorter height tank and more square. So is the gray tank. Pending tank size and where you can place these sprayers varies. 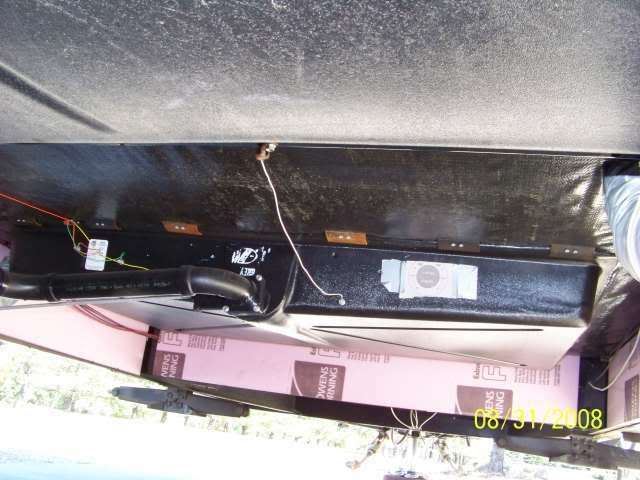 Sometimes it is more of how you can get in to even drill it in there… . A heads up if you are getting the rotary nozzle. Test it out on the lawn before installing. I ended up with one that would not rotate right out of the box. For those interested on what the spray pattern looks like, here it is. And now one that does not spin. Water does come out, but no rotation. Next is to figure out your tank location and how you can mount the sprayer. Sometimes there is a frame member in place of the “perfect” place so you use the next best place or be creative in drilling. Ideally on the black tank the sprayer points towards the outlet side/end to spray towards the drain. This is what Sunline told me as well on my T2499. If you can hit the tank sensors with the spray that is icing on the cake. 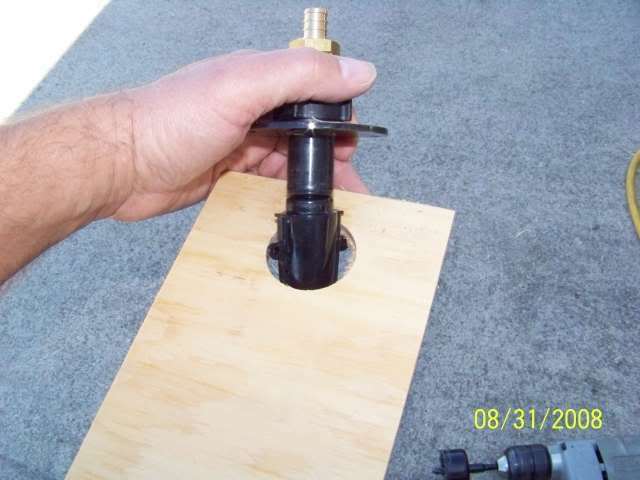 Before drilling in the tanks I did a test drill on a piece of ¼ plywood to make sure the hole size was right. 1 ¾ dia. Much smaller and it will not go inside and much bigger you cut into the screws. This is the size Camco states to use. Here is my black tank. Here is the gray tank. Here I could not get the sprayer on the opposite side of the outlet. However the gray tank flushing needs are different and you need more of a wetting rinse to get the soap scum out. Here I blast against the back wall and it runs out. 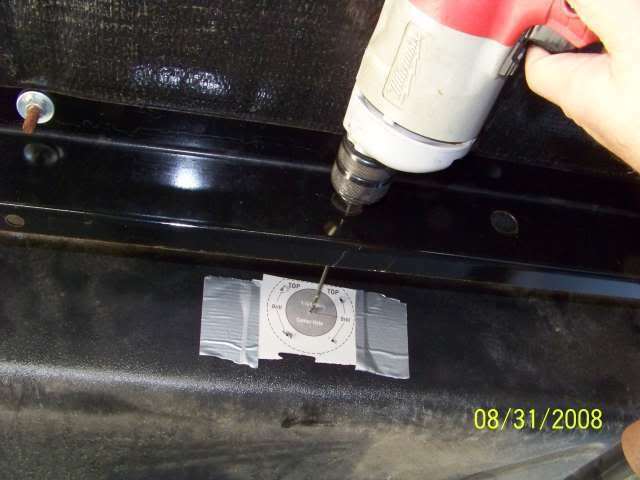 Camco gives you a drill template that you can tape on and drill pilot holes for. Here I had to get creative to work thru this cross member. An extended shank drill bit. And now a hole saw with an extension. You have to assembly it in pieces. 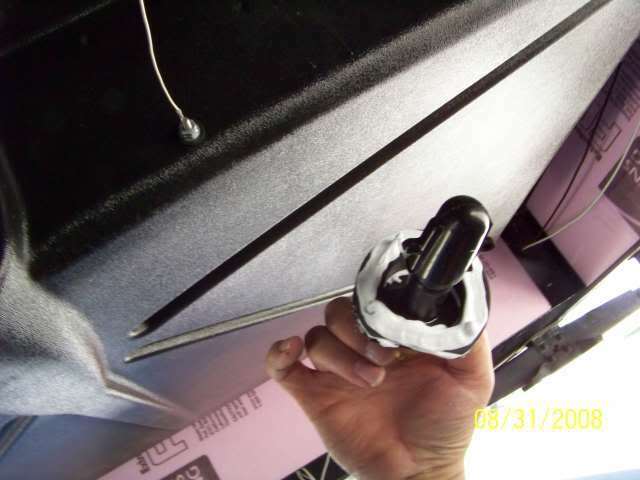 You want to pre tap the holes in the tank with the screws. I recommend you do this so you know for sure all 4 holes line up. If you pass over this step you will be doing it with a ton of silicone on the sprayer and make a mess if one hole does not line up. Now for the silicone. I apply to the sprayer and the angled adapter if you need it. I do not put it on the tank as if any hangs over the hole, you will get it on the spray head. Ask me how I know this…. I did the 1st one that way and the other 2 this way. When you tighten it up, it will ooze out. 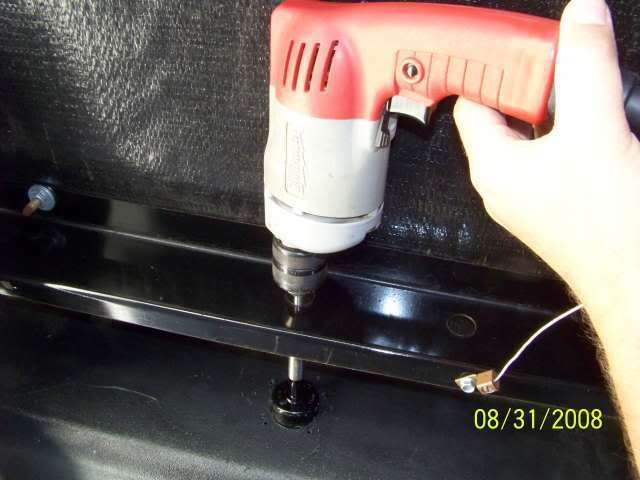 The silicone lubes up the holes so do not over tighten the screws or it will strip out. I could tell the 2nd time they went in real easy then the test fit to tap the hole. Then smooth it out if you like. Bring paper towels under with you. Ask me how I know why…… ..
Now to the pipes. 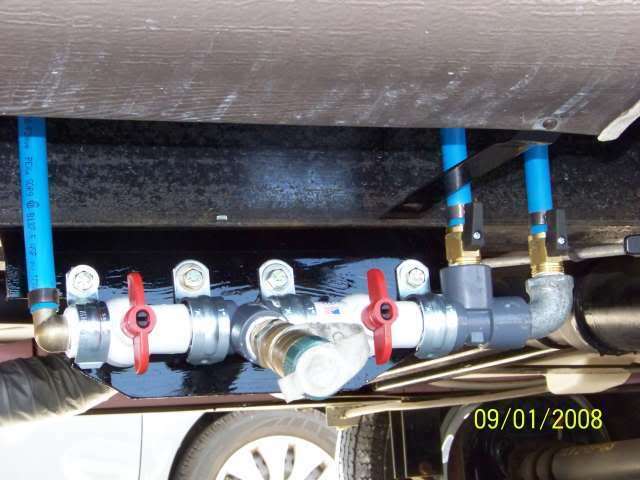 Camco can provide a simple hose and fitting that does would well in most applications. However in my case I went further. 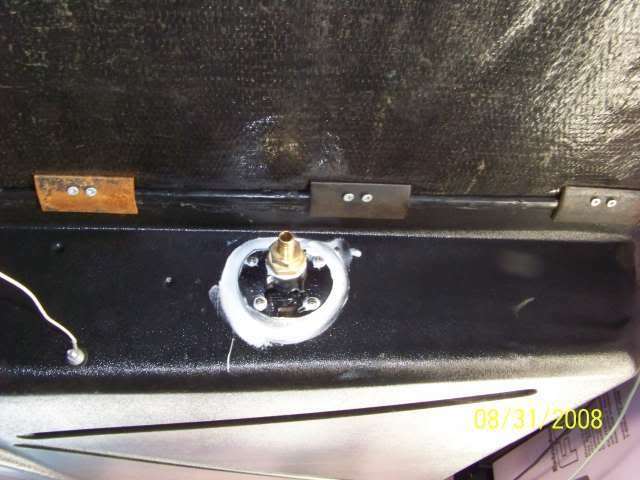 I have PEX tubing crimp tools and once installed right there is no leaks and no loosening over time. I did not want to chance a leak in the enclosed tank section so I went with the PEX fittings/tubing. I took all 3 to a manifold with valving. I can select which tank and which sprayer. Some CG's have good water pressure, others do not. Since I have 3 sprayers this give me all the options. 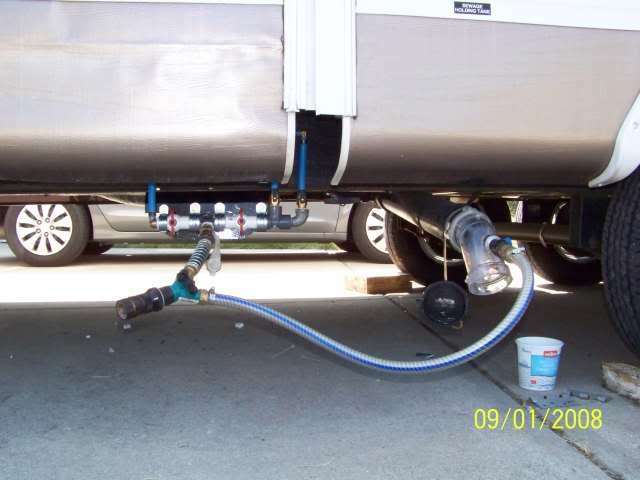 Here is how I hook up and use this in conjunction with my RV hydroflush. I had a similar set up on my older camper with 2 sprayers. 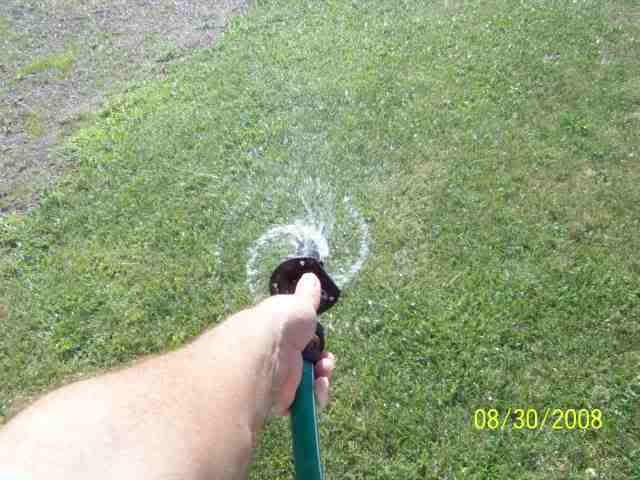 The hose has quick disconnects so it is snap on and off. 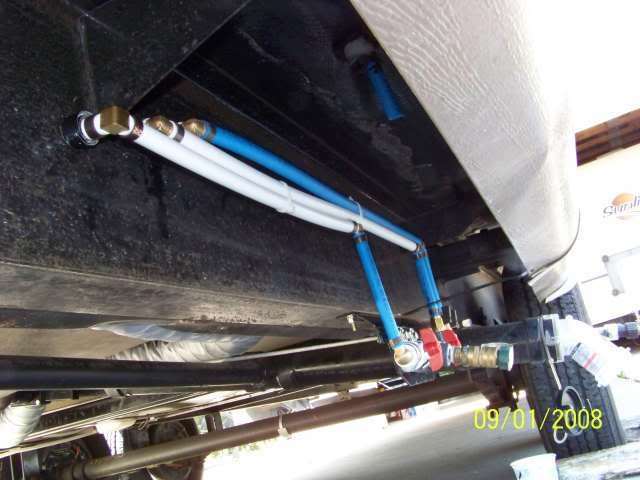 And then I install a plug in the water feed to keep road dirt out of the fittings. I used the hand wand thru the bath room window now for almost the last year on this new camper. It works well but is a task to deal with and I only get the black tank. I also had one garden hose shut off blow apart in the bath room…. : . Cindy could not run out and shut the thing off fast enough… . Oh what a mess…. 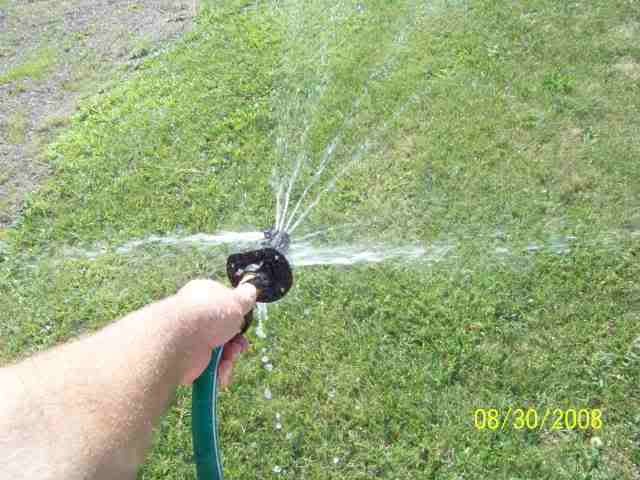 Never ever use a plastic hose shut off inside. Use brass…. Having the tank sprayer on the T2499 and now not having them, is like not having a power jack and then going back to the crank. You get spoiled quick. These sprayers are a luxary that once you have them, you will never go back. And when the DW keeps saying, When are you going to get those sprayers things installed! … . So tank sprayers are DW approved! Hope this helps spark some ideas for others and happy flushing. Thanks, since I'm being visited by the awful spectre of black tank removal, I'm thinking I'll put a washer in at this time. You are the ultimate diy explainer. I don't think anyone could explain this installation any better. For those thinking about installing the Tornado flushers, this explanation should get them off their duffs and outside to install the flushers. Thanks John, I'll get right out and go to work, right after I finish my TV program. John, Thanks so much! 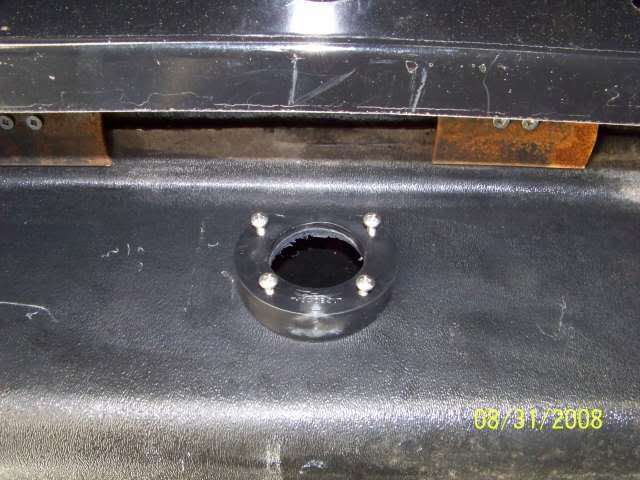 I just got the black tank drain repair done and I was thinking about putting on the sprayers. With your great photos and explination I will not hesitate to make this my next project. Thanks for sharing - awesome job, as usual. Your enclosed tanks definitely created a unique situation for you. I like how you adapted the water feeds to fit within the enclosures. 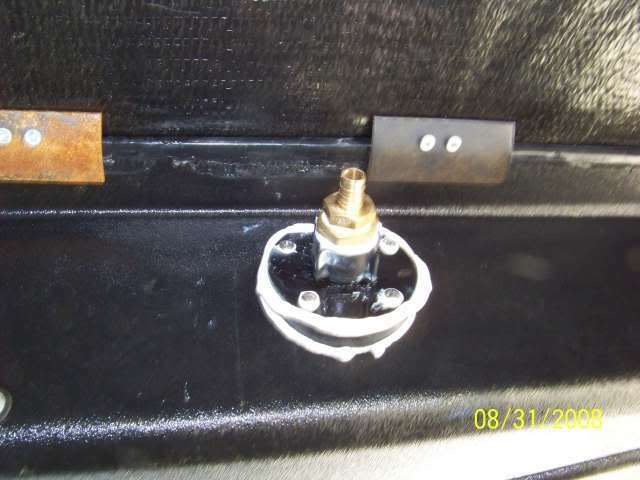 I also installed the Camco Tornado Tank Flush kits, very easy to install. 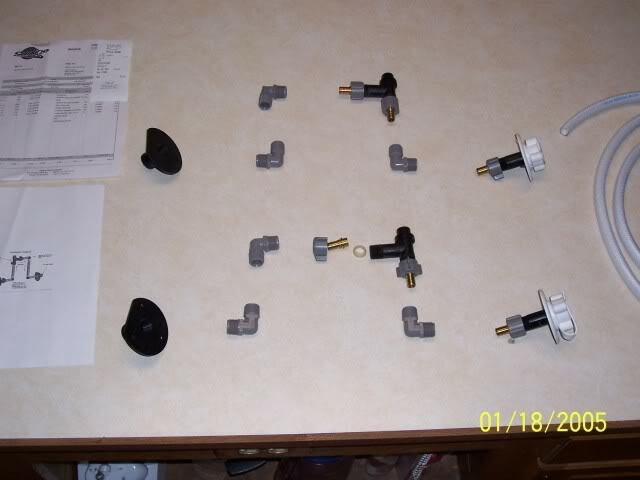 If anyone is interested in seeing pictures of an instillation using all the supplies provided by Camco that they include in their kit and within in a open frame, here’s a link to my Black / Gray Tank Flushing Kits post. Thanks for the kind words. The age of digitial pics makes installtion instructions a whole lot easier. I write tech manuals for work at times and the pics go a long way to getting a point across. Thanks Hutch for the kind words. Thanks for posting your link on this post too. I forgot about that. Other folks following can see both methods. I remember you saying yours sounded different then the normal Quickie Flush straight ones. I only have had the straight ones to compare too so far. Going camping next week and then I'll be rotary sound calibrated after the maiden flushing. 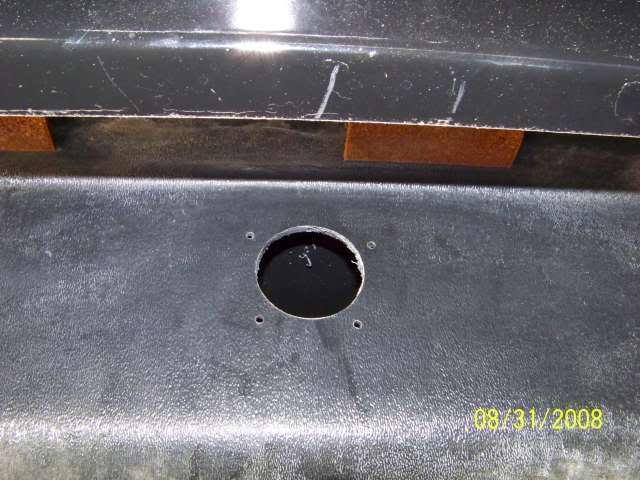 Thanks for the description w/pix-excellent job and workmanship looks top notch. I installed a Tornado in my black tank but before that I checked it with my garden hose like you did. The swivel head wouldn't turn as in one of your pictures, but I thought that could be from my house water pressure being too low at the time (we're on a pump) so I installed it. 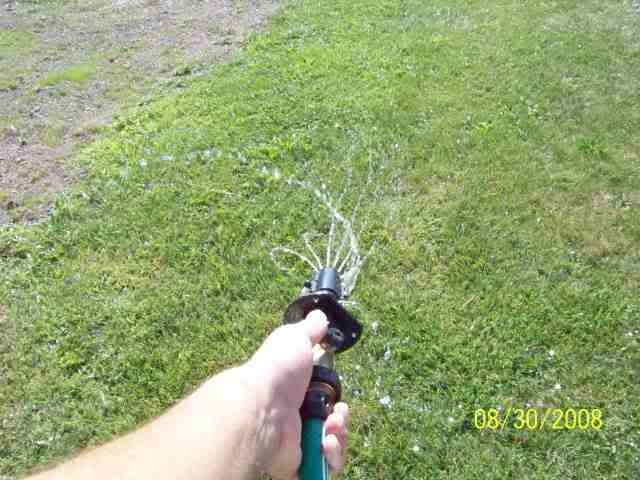 The first time out, I couldn't wait to try it, then was disappointed to find the CG had a trigger nozzle tightened to the only hose available. You should've seen me struggling to align that nozzle against the rubber washer in the threaded connection . I hope that setup isn't too common in most CG's. So, anyway, the flow of water coming out of the drain was not as fast as I'd expected, but it did seem to push a lot of "stuff" out, so it was a definite improvement over gravity. I'll be camping this weekend, hopefully I can get a good connection this time. If you have any input on the swivel head I'd like to hear it. 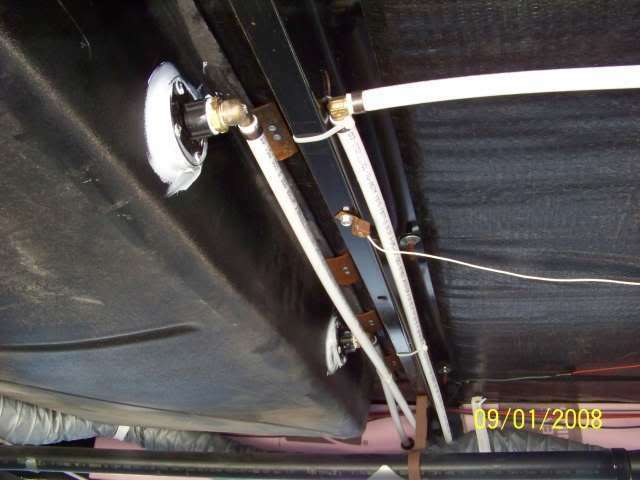 Unfortunately, a lot of the campgrounds that I've been to have a hose attached to the bib on the tap with a clamp and the other end is cut with no thread connection to the cleanout or flusher. 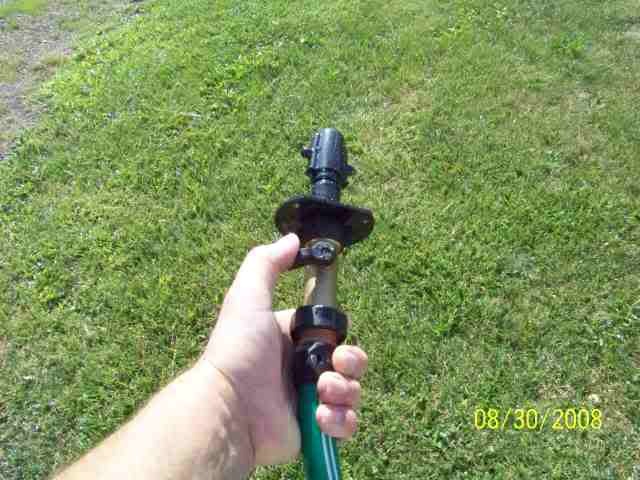 I've attempted to hold the end of the hose to the backflusher and ended up getting wet. 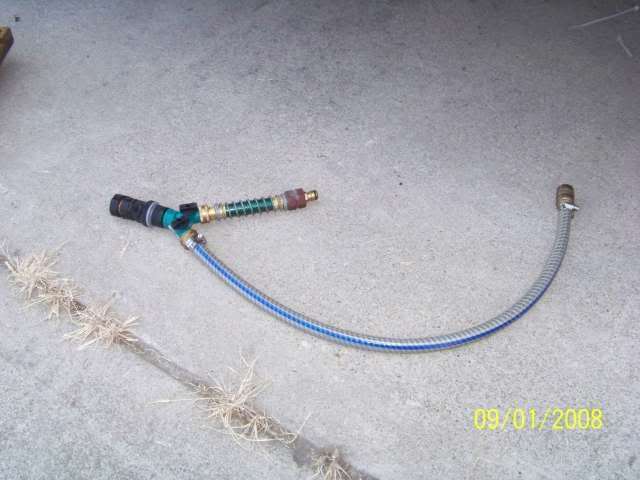 I suppose to many campgrounds have lost too many hoses. 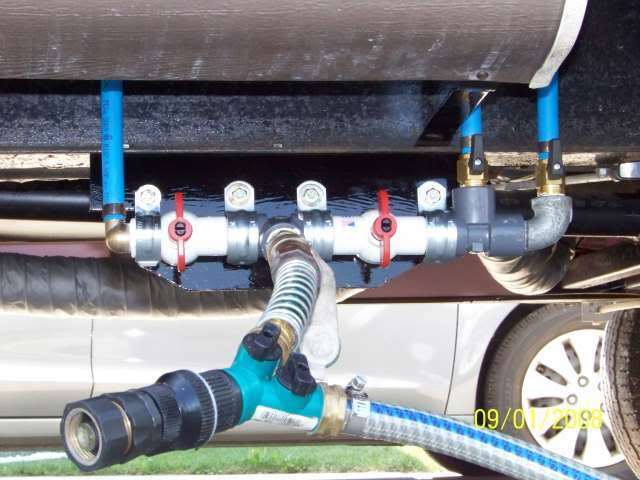 Slides onto the hose or an unthreaded bib and attaches your hose. Edit: I read a post on another forum where he had found these in two different colors, used one for potable water, and the other for flushing. Excellent! Thanks for the link Mack, I'll have to get one of those to keep in the camper. Thanks a lot Mack. This device would be a saver for my pants not getting wet. I will pick one up next time I'm at CW. I installed a Tornado in my black tank but before that I checked it with my garden hose like you did. The swivel head wouldn't turn as in one of your pictures, but I thought that could be from my house water pressure being too low at the time (we're on a pump) so I installed it. 1st, thanks for the kinds words. Now on the non spinning nozzle, this must be a bigger issue as now 2 of us have the same problem. In my case I bought the 1st Toranada about 1 ½ years ago as I was going to install it in the T2499 to supplement my stationary nozzle. I wondered how it would spin so I tried it first back then and it did not spin. I never made it around to returning it so I still have it. Then the new camper came and I bought 2 new ones. So I have 3 actually and tested all again. The 2 new ones worked and the 1st still did not. May have been a early manufacturing problem or I just was unlucky the 1st time. Having a working one and a non working at the same time to compare did not really turn up any smoking gun on why the one would not spin. I even tried the non spinner in a 5 gallon bucket thinking the 2 big jets needed a tank side to blow against to help create the spin. But it did not help. Spinning them by hand side by side I could not really tell a lot of if any drag difference on why one worked and one did not. The only thing that made any sense was excess friction but the nozzle is sort of a sloppy fit to start with. Something that might help for a while is to silicone spray the nozzle throat area to help cut the friction. However it would have to be out of the tank to do this which in your case would not help. I have never used this but they make some type of coconut oil you put in the black tank to lube up the slider dump valves. This might help free up the Toranada. I silicone spray my slider valves so I do not have to use that tank lube treatment. Basically you have a stationary sprayer with 2 jets sort of pointing in strange places…. I’m sure it still helps, just close the tank valve for only about a minute and then redump/refill a few times. The floating action helps too. I tried my double units out last weekend at the camp ground. They do work well and make a real strange buzz spinning noise. I can tell the 2 of them work better then my older 1 stationary in the other camper. But this may be a volume thing as well. The water thief… I have a story to pass along that is almost comical. I bought one and had it for almost a year never using it until that right CG came along where it had no fresh water hose threaded barb to fill up. So I pulled out my trusty water thief. I also use carbon ceramic filters when filling my fresh tank at the CG. So here is the comical trail one summer night, getting dark arrived in a new CG. Find spigot has spring return handle and chromed smooth water spout. Pull out the trusty Water Thief. 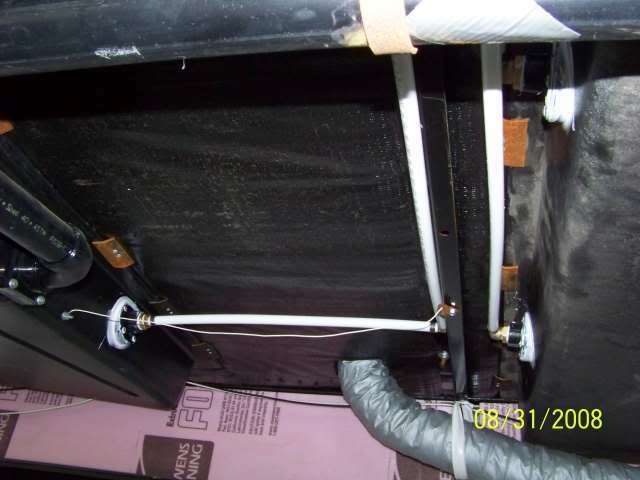 Hook up hose and filter. Turned on water, after water fills the hose and reaches the filter, powwwww the 1st blow off of the Theif and it just missed soaking me. So I held it on and tried again. Now the rubber was wet and it blew off before I could even get the valve full on…. So I added a hose clamp on the spigot end and tried again. This time some water came out of the filter for about 30 seconds and powwwww the 3rd blow off of the Thief and sprayed me… H’mm need more clamps. So I went to the trusty extra fitting box I carry and came out with another one. So I now have 2 clamps on the spigot end. Now water is filing the tank well for about 2 minutes. powwwww the 4th blow off of the Thief is starting to soak me. OK this is no longer fun… Now the brass hose barb blew out. Well another clamp comes. Now I have 3 clamps on the thing. Turn it on and it is working. Yes, finally. Well it worked for about 5 minutes and then, OMG the rubber on the Thief started to blow up like balloon the size of a softball…. I tried to hold the thing together trying to fill the tank. Old faithfull was about ready to blow. Point: Unless you want to bathe out in the open CG, do not put a water filter on the end of it or anything that creates a back pressure or else…. PS I have not yet but will make a more industrial duty Theif that can take the pressure.... as every once in a while they do come in handy. JohnB, it sounds like the CG may have also had inordinately high pressure in their water system. I regularly use a water thief with a filter and don't have this issue. But them my water thief(s) are not the commercially sold ones. Mine are made of several different sizes of tubing, and use worm clamps that I tighten with a nut driver.